Fireplaces are often the focal point of the family or living room. Fireplaces bring warmth, comfort, and romantic ambiance to a home; however, ornamental masonry style fireplaces are being quickly replaced with eco-friendly fireplaces. Standard wood burning fireplaces have negative impacts to the environment such as tree reduction, toxic particulate matter, production of carbon monoxide, nitrogen oxides, methane, and Volatile Organic Compounds (VOCs). Eco-friendly fireplaces have minimal environmental impact and produce less pollution. There are five major categories of eco-friendly fireplaces on the market. Ethanol- These fireplaces burn biofuel called ethanol which is derived primarily from corn and sugarcane. These models are also easy to install into existing, wood burning fireplaces. 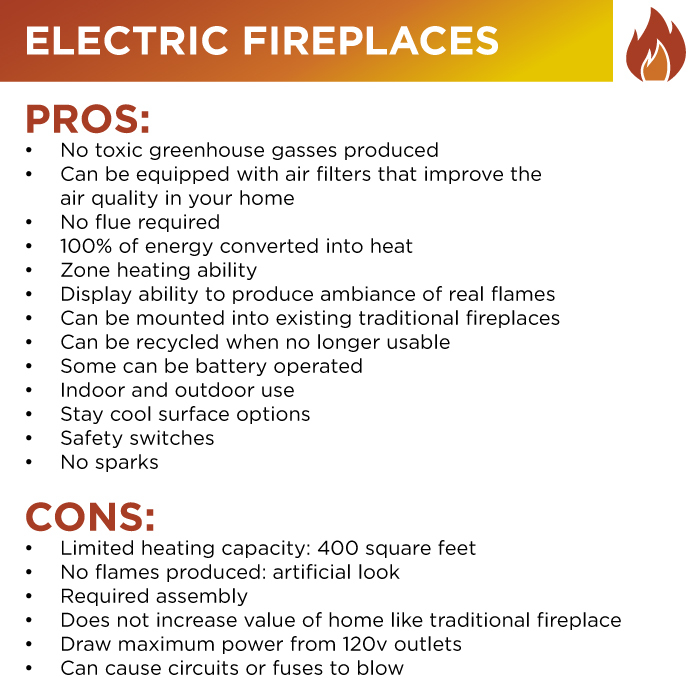 Electric- Electric Fireplaces do not produce toxic fumes or greenhouse emissions. No fuel is required and 100% of the energy is converted to heat. Wood Burning- There are eco-friendly wood burning options that begin with choosing firewood that is harvested locally from dead trees and replenished. Pellet- Pellet burning fireplace stoves use pellets made from compressed sawdust, tree bark, agricultural waste, and other organic materials. They produce high heat efficiency and little pollution. 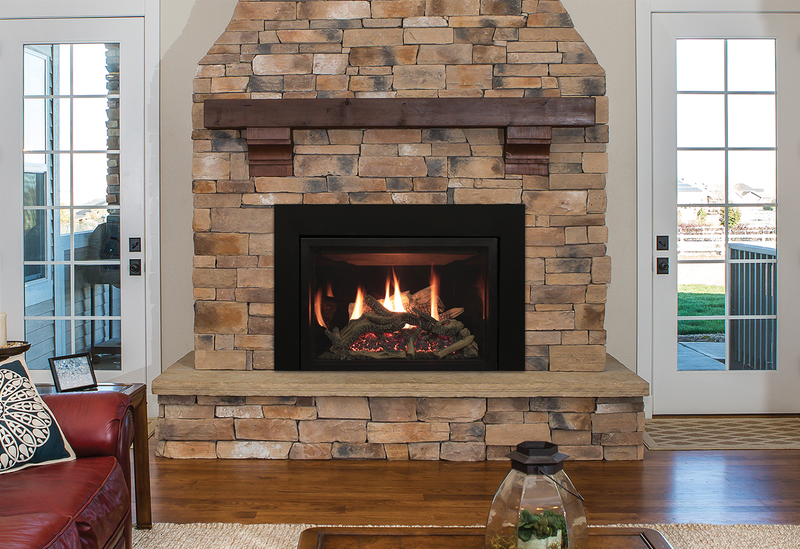 Gas- A gas fireplace uses gas logs to mimic a wood burning fireplace. They still burn fossil fuels (LP or natural gas) but have lower emissions and produce a hotter temperature than other options. The definition of eco-friendly is "not harmful to the environment" however it is exceedingly difficult to find products that have absolutely no impact to the environment. Most products that claim to be eco-friendly cause little to no direct ecological damage but when consumers look deeper, the indirect ecological damage becomes clear. Direct ecological damage is a result of direct interaction between the product and the environment. This can include emissions produced by the product. Indirect ecological damage is not a result of the product, but can be linked to the product, such as when building a road does not directly impact the surrounding water supplies, however runoff from the road may. Another example of indirect environmental impact includes how the materials for products are sourced or manufactured. 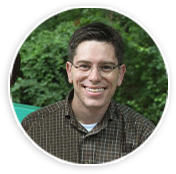 When researching eco-friendly options, the customer must ask themselves, "what do I perceive as less damaging to the environment". The most eco-friendly fireplaces on the market should be the least damaging to the environment overall. True ecological impact is difficult to measure due to a number of variables and factors that are not completely understood. For a full understanding, the customer is encouraged to research who supplies their power, who would supply their fuel logs, and where they would buy pellet fuel. After knowing the full impact of their fireplace, the customer can make the most informed decision when purchasing an eco-friendly fireplace. Electric fireplaces are considered one of the most eco-friendly options on the market. They cause almost no direct environmental impact and indirect impact is low to moderate for most areas. Electric fireplaces are a popular alternative to traditional fireplaces because they are low cost with many different options available. If you are looking for an eco-friendly fireplace that you will only use occasionally or want the indoor/outdoor use ability, an electric fireplace is the best option for you. These fireplaces will not heat the entire home however and may cause increase in costs to your electric bill. Electric fireplaces are considered eco-friendly because they have no negative direct ecological impact. They produce no green house gasses, do not burn fossil fuels, and can be recycled. 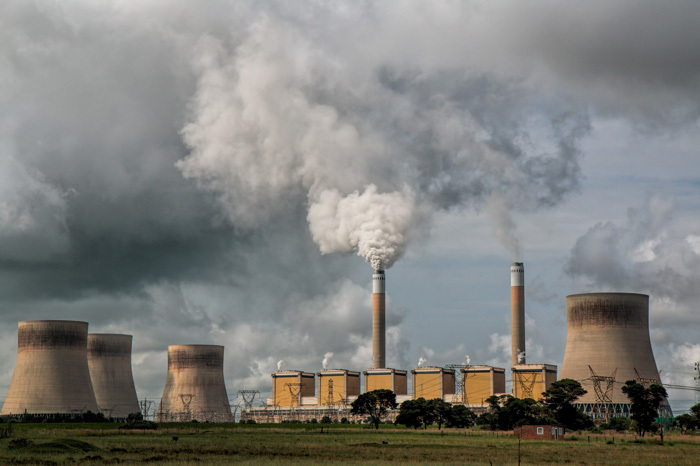 Consumers should research the indirect environmental impact to electric fireplaces however as their may be environmental impact in the way that these units are manufactured and imported/exported. Ethanol fireplaces burn biofuel (ethanol). Ethanol, also called ethyl alcohol, is an agricultural byproduct that usually comes from corn. They are clean burning and the second-best option for eco-friendly fireplaces. 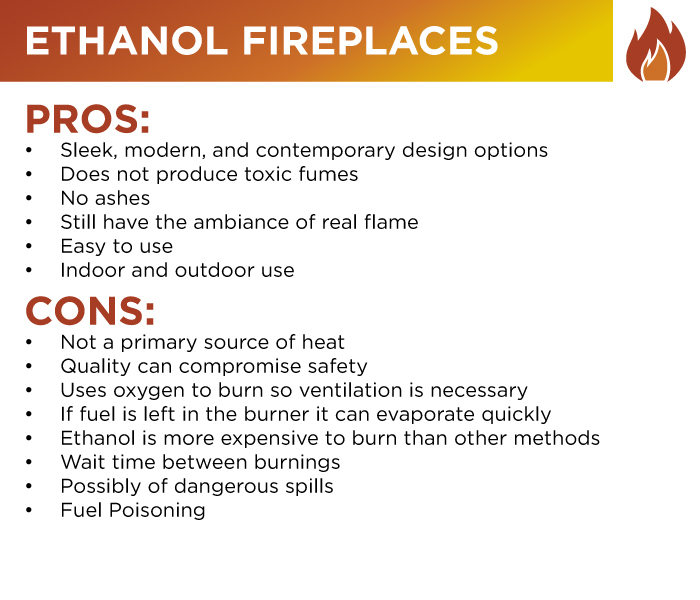 While ethanol burning fireplaces are the most eco-friendly when it comes to a live flame option, these fireplaces can also be dangerous. Ethanol can be fatal in liquid form if ingested and does not smell. Ethanol is also clear and extremely flammable, so spills need to be cleaned up immediately. Installation of an ethanol fireplace is extremely easy and tabletop versions are available that require no additional set up. Ethanol burning fireplaces are an ecofriendly option because they are clean burning and considered the most eco-friendly fuel alternative. Ethanol is a renewable energy produced from corn, potato, and other agricultural byproducts. However, there are concerns about the pollution created in the manufacturing process and indirect environmental impact. Pellet stoves are unlike traditional fireplaces because they are a stove that uses biomass pellets to create heat that is sufficient to heat a small home. They are typically made from cast iron and stainless steel. Customers who need an eco-friendly fireplace option that heats the entire home will find a pellet stove as their best option. Pellet stoves produce dry heat that is energy efficient. Energy in pellet stoves is produced from wood mill byproducts so energy is created from something that would usually be wasted. Pellet burning does not produce smoke, so no exterior ventilation installation is required. 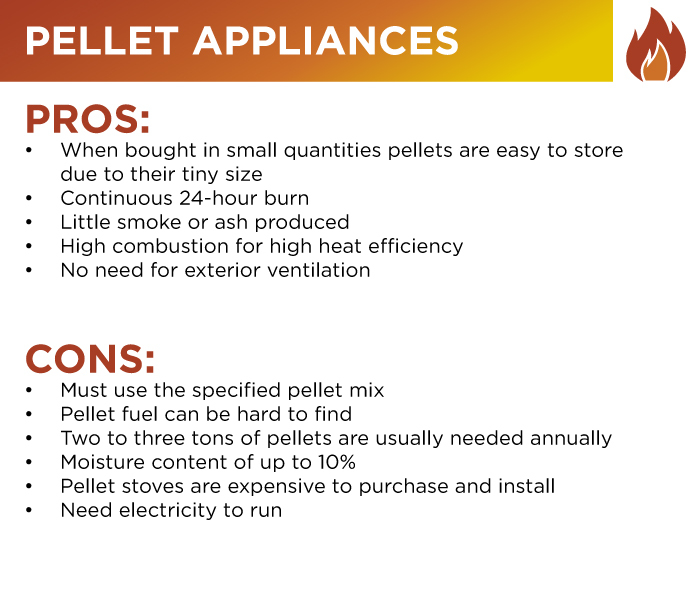 Pellet stoves do not require certification for pellet stoves because they are considered one of the most environmentally friendly options for residential heating. The EPA endorses pellet stoves because no creosote is produced meaning they exceed clean air standards for in-home heating. Customers who are set on using a wood burning appliance should consider those that are high efficiency. Fireplace retrofits can be installed to reduce the wood smoke pollution in existing wood burning fireplaces. When shopping for wood appliances look for high efficiency ratings and EPA certification. Wood burning stoves, even high efficiency ones have the most impact to the environment of all eco-friendly fireplace options on the market. If you choose to have a wood burning fireplace or appliance keep in mind the installation costs are going to be high due to the need for ventilation because of smoke and particle pollution output. Choose a model that is EPA certified when shopping. Even high efficiency wood burning appliances are not as user friendly compared to other ecofriendly options. The combustion zone must remain at least 1,100 degreed F otherwise the VOCs will not combust, and the wood will smolder. Wood must be dry and added frequently to keep the temperature hot. Unsealed wood appliances are wood burning stoves that are appliances that atmospherically vent. Unsealed wood burning appliances pull both combustion and dilution air from the interior of the home for the flue gasses. These appliances can become dangerous as homes become tighter because back drafting can occur. Back drafting occurs when exhaust fans and other methods of ventilation fight over the quantity of air. When these appliances run simultaneously gases from the heating systems flue can be pulled back into the home releasing toxic gasses. When choosing a wood burning appliance you should choose one that uses sealed-combustion to avoid the dangers of back drafting and spillage. Sealed appliances use flues and burners that are separate from the interior of the home through ducted air intake. Unsealed wood appliances can be made more environmentally friendly by having working dampeners, removing creosote, cleaning out the ashes, using a fireplace guard, and making sure all of your home fire detectors are working. Gas fireplaces uses natural gas to burn which is cleaner than burning wood and much more convenient. They turn on with just a flip of a switch. Gas burning stoves and appliances are cleaner burning than wood however the excavation of natural has called fracking has severe negative environmental impact. Natural gas is also poisonous if too much is released into the air and can even be fatal. Natural gas is also a nonrenewable resource and contains up to 95% methane which is a toxic green house gas. 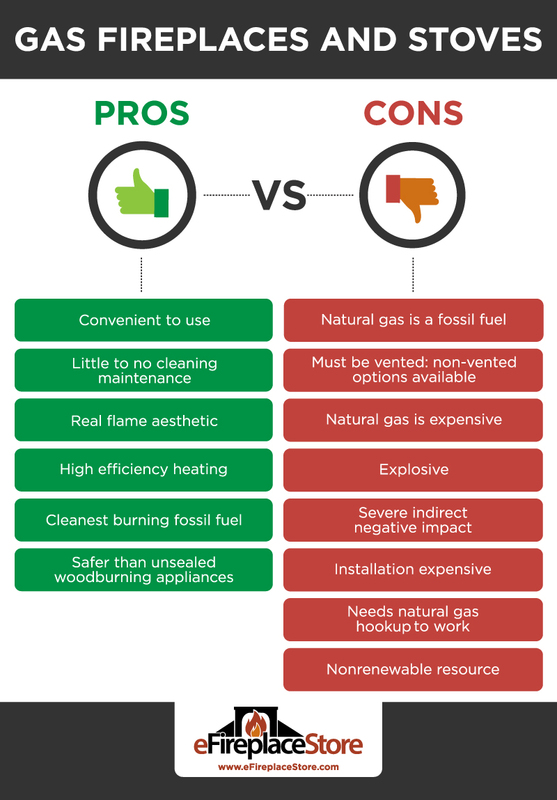 Natural gas fireplaces are considered eco-friendly because they are clean burning however, they have the biggest indirect environmental impact of all the eco-friendly options on the market today. Nearly all fireplaces made after 1990 are far more energy efficient and eco-friendly than older models due to the Clean Air Act of the 1980's. However, there are certainly models of eco-friendly fireplaces that are more eco-friendly than others. 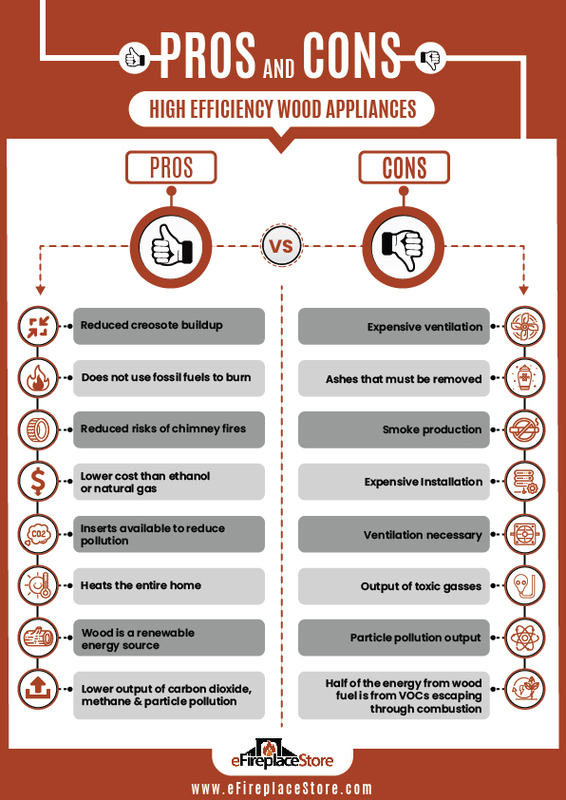 Direct vs indirect ecological impact must be taken into consideration when choosing a fireplace. While the direct impacts of options such as ethanol burning fireplaces or electric burning fireplaces may seem small, the indirect options such as the pollution created in manufacturing might be significant. Customers should also keep in mind the safety aspects involved with choosing the best eco-friendly fireplace on the market, especially when children and animals live in the home. The top three most eco-friendly fireplaces in our opinion are electric, ethanol burning, and pellet burning.